The next serie of doodle girly template, Girl Gift. 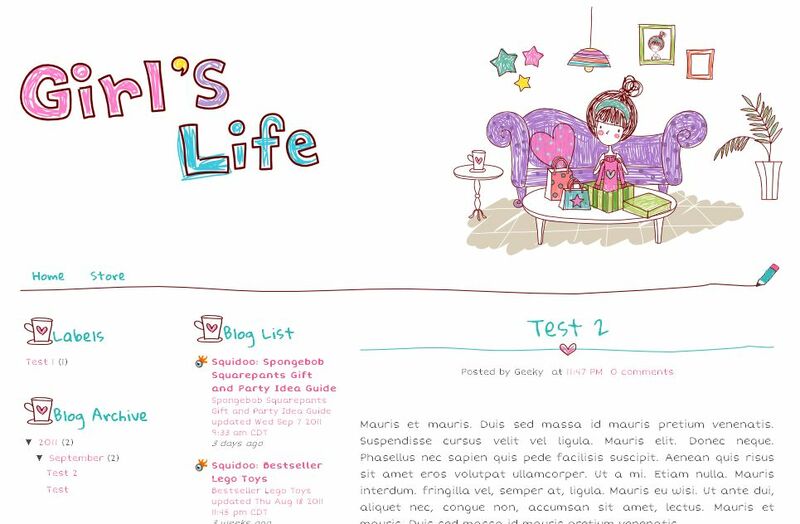 You also can check the previous template, Girl's Life. Still about girl, who won't be happy if someone give us a gift? Every girl likes gift such as clothes, make up, accessories, etc. Even you can use this template for your gift online store. Still same with previous theme, I use fresh color, blue, pink, and purple. 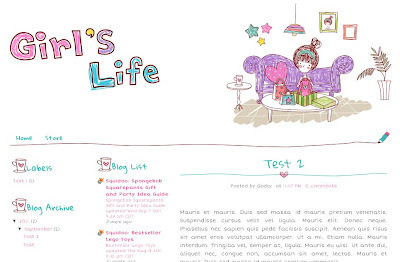 And look at girl illustration on header, really cute. You also can customize its header logo by uploading your own blog logo. could teach me how to make me own blog logo??? UDAH DI DOWNLOAD,HTMLX DH DIMASUKIN KK GK BISA2?? Every girl likes gift such as clothes, make up, accessories, etc. Even you can use this template for your gift online store. great thanks for sharing this one.. Thanks for publish all the awesome templates! I will use them soon! How to use this template on blogger new templates format? can you advice to installed with posting? Good post. I’m been looking for topics as interesting as this. Very informative and information presented very well. I really liked reading your post which has delivered a great news about the opportunities that will be helpful for the people who are jobless.This significant opportunities will play an important role in developing the success of the people. What a lovely and more interesting gift because on the site has been published the different types gift shared on the site that can be enjoy it in this gift. caranya gimana sih ? download dulu ya ? saya sudah coba download tapi keluarnya aneh. Girls gift blogger template is very nice template and enjoyable so that can be used and know that regarding blogger. Mostly are very used and know that. Often people are very like it and enjoy it in this blogger because it is very interesting and enjoyable blogger so that can be more enjoy it in this blogger. Hi i like this post and design so much.but i cant download this file successfully.how come is it? Girls gift blogger so very well and more interesting blogger shared on the site so that can be enjoy it in this blogger. mostly people are very like it. In this blogger so nice and interesting blogger shared on the site. Often people are very like it and fantastic blogger shared on the site so that can be enjoy it. Nice templates :D teach me how to design our own templates?? What program that you use?? Love it my fave series -- more please. Such a cute template. Quick question, though. What fonts did you use for the comments section? Is it a custom made font is it one that is available for download? how to apply this template to blog? I can't hardly wait to use this template! gimana cara makenya ke blog ya ? totally amazingly cute. Did you make the design itself? I mean the character and the drawing itself? Love it! Hi.I really like this template and i wanna use this but i don't know how. Can you teach me how to? thanks! Haii,, I want make this template only two row. So what i should do? Love this! But is there any way to switch the rows so that the posts are on the left hand side instead of the right? veryyy loveee this template :* tengkyuuu .so cuteeee :D aaakkkk >.< !! i like this template but its not working on mine . now, i'm finally using this. thank's :) It makes my blog look like it's soo meee..
lucuuu... sukaaaa.. tapi di preview kolomnya bisa kanan kiri dengan posting di tengah, kok pas diaplikasikan ke blog saya nggak bisa ya? apa ada proses yang salah?